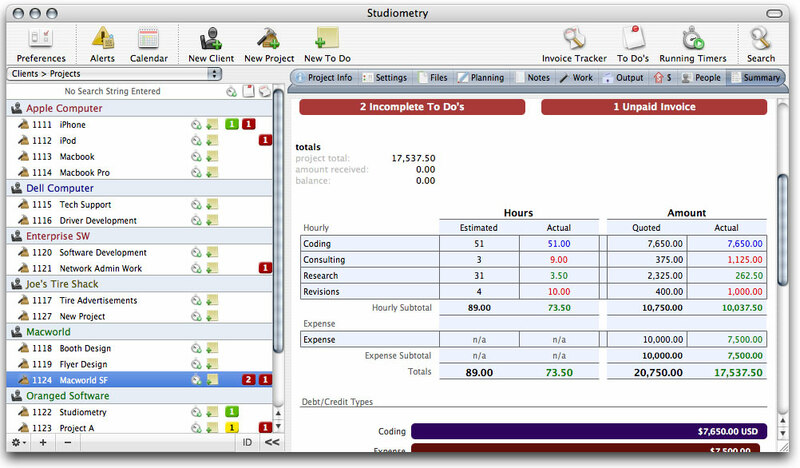 Studiometry 5 has many new abilities for creating and viewing estimates for Projects. When creating a Project, you can now assign a specific number of hours for each Hourly Debt/Credit type and a specific amount for each Expense Debt/Credit type. Studiometry will take the entered information and calculate the Amount Quoted and Estimated Hours. You can later edit this information, or compare the estimates to the actual work for each type in the Project’s summary tab. As you can see, these new features give you greater control and easier access to information regarding which types of work are being done on a specific Project. Having easy access to reports like these can help streamline your work and make future budgets and quotes easier for you to estimate. The new information in the summary tab as well as the Estimate calculator are both printable, giving you the ability to create estimates for your Clients, or for in-house use. More features regarding estimates and quotes will be added in subsequent 5.x releases. Studiometry 5.0 is slated for a late Summer 2007 release. Be sure to keep an eye on the Studiometry Blog for more sneak peaks at upcoming Studiometry features! You can now sign up for the Studiometry 5.0 Beta Program mailing list. The first beta version will be released early this week, so make sure to sign up early. Studiometry 5.0 has many new features to allow quick and organized access to your data. Please note that these features are still under development and any aspect of these features may be changed when Studiometry 5.0 is officially released. Here are a few examples of some of the upcoming features. With Studiometry 5.0, you will be able to horizontally expand the main window Client/Project list to view additional information regarding the current status of Projects. 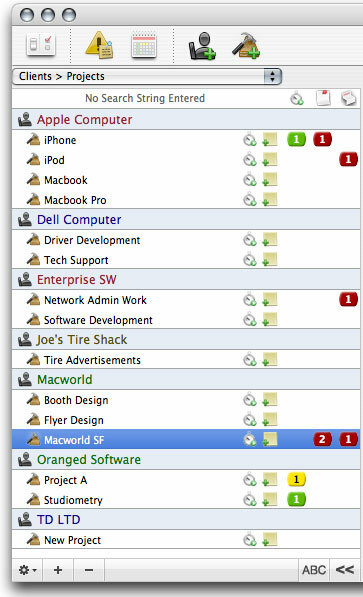 Three additional columns display the number of Running or Paused timers, incomplete To Do’s, and Unpaid Invoices. Clicking on any of the totals will bring up the associated list for viewing and editing. 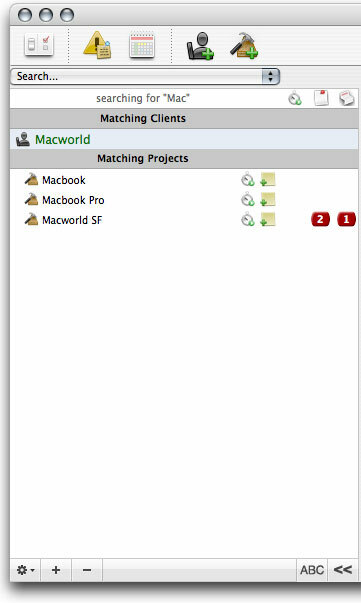 This small addition makes a big different when you want to quickly view the current status of many of your Projects simultaneously. As mentioned before, you can click on each total box to bring up the appropriate list of items, giving you very easy access to current items. 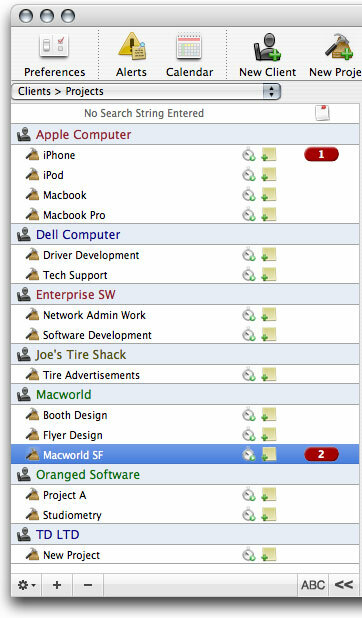 This feature also takes into account the current employee’s permissions. If the current employee does not have Invoice or Timer permissions, then those columns will not be shown. Studiometry now allows you to filter the main Client/Project list, searching through names and ID’s for the entered text. Left-Clicking on the search row, or selecting “Search…” from the View Mode menu above the list, will allow you to enter a search string. Studiometry will filter out the view to only show Clients and Projects who’s ID and/or Name match the string. As you’ll notice, the Expanded Project information is still readily available. The Clients in the list also maintain their “clickable” properties, allowing you to select a Client to view all of the Client’s associated Projects. 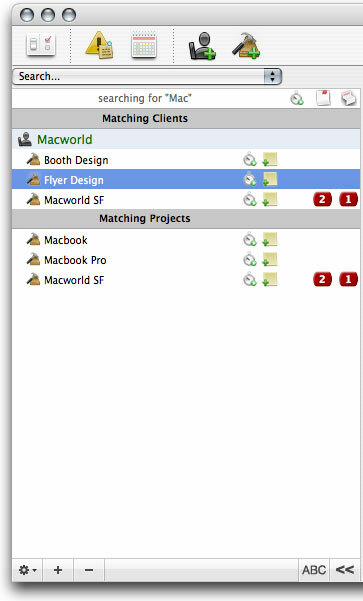 The filtered Projects list, visible below the Clients list, shows all Projects that match the search string independent of their associated Client. You can easily Right-Click on the search string or select a different viewing mode from the menu above the Client/Project list to remove the search filter. Many areas of the program now incorporate an Auto-Complete combo box that allows you to click or type to select your desired Client or Project. This feature is currently available when creating a new Project, entering a Time Sheet, creating a new Running Timer, and when creating a new Contact Log. This feature can be a great time saver when entering information such as large time sheets, or simply creating a new Project. The New Project window now can be completely operated without the use of a mouse, allowing you to keep both hands on the keyboard and create Projects much quicker. Studiometry 5.0 is slated for a late Summer 2007 release, however the Beta Program registration will be opening within the next week. Also, be sure to keep an eye on the Studiometry Blog for more sneak peaks at upcoming Studiometry features!